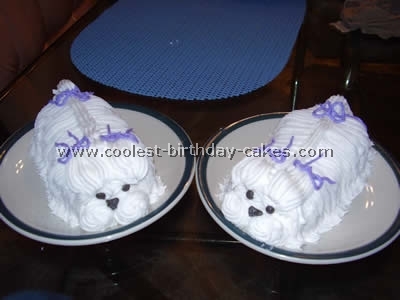 I found the idea and cake recipies for this cake from this website! It was super easy to make and everyone loved it! 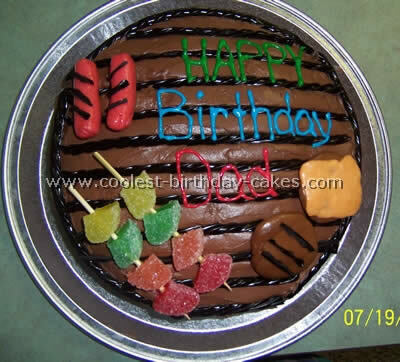 You will need two 8-inch layer cakes frosted, and then I used black Twizzlers for "grates", tootsie rolls for the burgers with cut up Twizzlers for the grill marks, an orange starburst for the cheese and red starburst for the hot dogs. I cut up the sugared fruit slices and put them on skewers. I do have a frosting tip though, when you buy a tub of ready-made frosting, dump it in a bowl and use an electric mixer to whip it up! It increases the amount of frosting you have! And the less frosting you have to use the less calories and sugar you’ll be consuming! The actual BBQ is a Rice Krispie cake and all the food and decorations are made from chocolate or Candy clay! This one was fun to make. The smokies are cherry flavored, the cheese is vanilla and the burgers are mint choc! Candy clay is easy and fun to make. 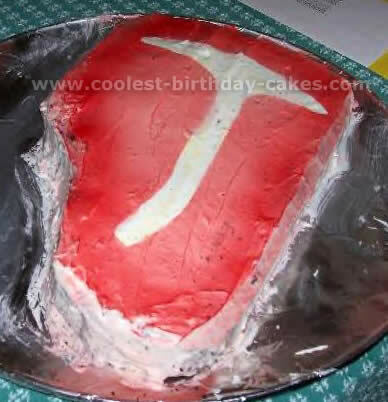 Thanks to this website for cake recipes! I found many ideas here. 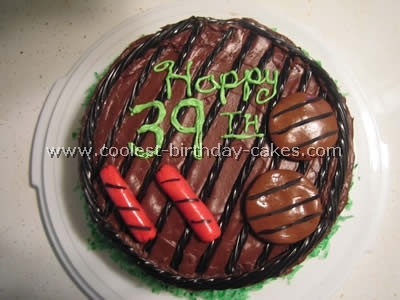 This cake is a two-layer 8-inch cake with chocolate frosting. I used Tootsie rolls for the hamburgers and red starburst candies for the hot dogs. 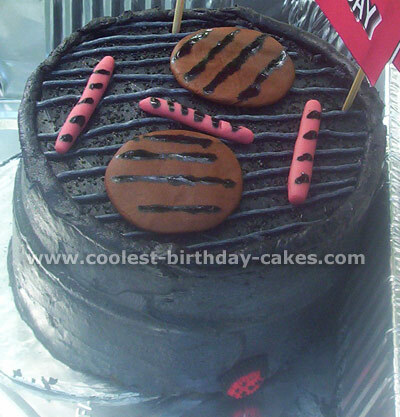 The grill and grill marks are sliced up black licorice. I was searching the internet for some cake recipies and came across this website. Thank you Belinda M. from Bronx NY for this great idea! 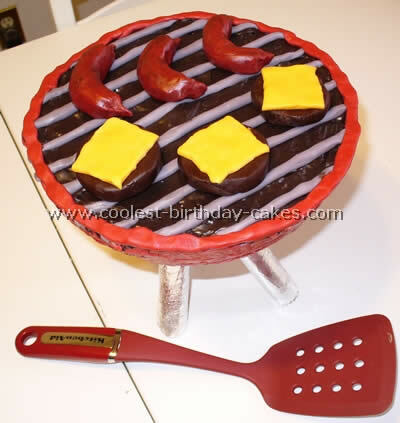 All the kids at the party wanted hotdogs and hamburgers with their cake and ice cream. I made this cake for my brother-in-law who loves to grill. I used: 1- Reg. Box Cake Mix, Wilton buttercream icing, black, brown and red food coloring, 2 Chocolate Chip cookies, and 2 Twinkies. I put a little bit of black coloring in the white Wilton icing, just a little to create gray. With a toothpick, I outlined lines for the grill. I frosted the two Chocolate Chip cookies with brown icing (burgers) and put a few black lines on top. I mixed red and brown food coloring with the icing and frosted the Twinkies (hot dogs) and put some black lines on top of that. I bought some gummy burgers and placed them around the cake. This idea was spawned from a long-running anecdote among our close-knit circle of friends, who happen to have a strong affinity for steak. So, for those of you who share our passion for the tasty cutlet, here is how to make your very own [aptly named] "Steak-Cake" (it even rhymes!). We began with our basic cake recipies [chocolate, our personal favorite], and preparing the cake in a 9×13 trusty (but-not-rusty) Pyrex glass pan. 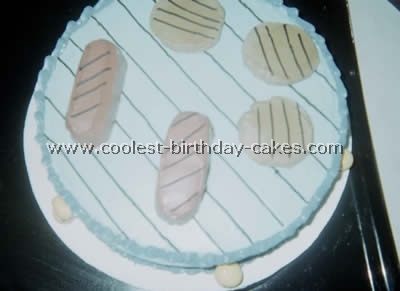 After allowing the cake to cool entirely, we used our "blueprints" to round off 3 corners slightly and carve out a curvaceous hollow, mimicking the outline of a perfect T-bone steak., Then ice the cake with a creamy white icing – we really liked the butter cream variety! [*Tip: microwave the icing for 12-15 seconds to get it to a nice, spreadable consistency]. What T-bone steak would be complete without the T-bone, of course?! We met our toughest challenge by using wax paper, greased on both sides with non-stick spray, trimmed into the shape of a bone and used the most amazing new product on the market – red spray icing!!! 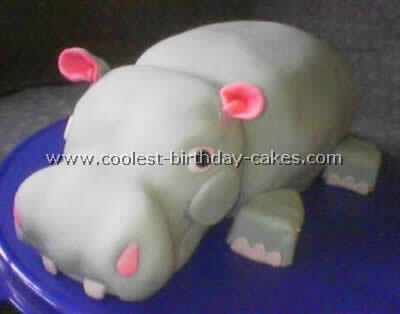 (to achieve the realistic effect on the top of the cake). And voila! Our friends loved it [almost] too much to eat it!! Best of luck with your Steak-Cake!